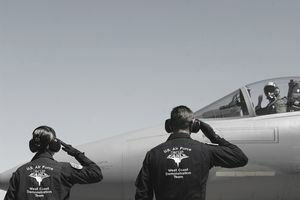 The Air Force Officer Qualifying Test is used to select college graduates for entry-level officer positions in the U.S. Air Force. It helps determine which military occupation would be the best fit. The tests are rigorous but designed to measure skills and aptitudes based on what the Air Force needs in its recruits. The 2015 revision of the AFOQT makes several changes. It has a new reading comprehension test that was based on officer professional military education materials. It tests for instrument comprehension with modernized instrument displays. It has a situational judgment test that uses realistic scenarios. The updated AFOQT assesses candidates on verbal analogies, arithmetic reasoning, word knowledge, math knowledge, reading comprehension, physical science, table reading, instrument comprehension, block counting, aviation information, and situational judgment. The test questions were updated throughout the test when it was revised in 2015. Specific sections were also changed. The reading comprehension subtest was added, and its score contributes to the composite scores for Verbal and Academic Aptitude. It is based on being able to understand the content of officer Professional Military Education (PME). Another subtest, situational judgment, also was added. It scores how you use judgment in interpersonal situations that an officer is likely to encounter. The instrument comprehension test was added to include graphics and modern instrumentation of Air Force aircraft. And the physical science subtest replaced the general science test. Scores from the subtests generate verbal, quantitative, academic, pilot, combat systems operator, and air battle manager composite scores. Pilot Composite Score: Used as part of the overall Pilot Candidate Selection Method (PSCM) score. Subtests included: Math Knowledge, Table Reading, Instrument Comprehension, Aviation Information. Combat Systems Officer (CSO): This was formerly the Navigator-Technical composite. Subtests included: Word Knowledge, Math Knowledge, Table Reading, Block Counting. Air Battle Manager (ABM): In addition to elements of the pilot composite, it includes the subtests for verbal aptitude and spatial ability. Subtests included: Verbal Analogies, Math Knowledge, Table Reading, Instrument Comprehension, Block Counting, Aviation Information. Academic Aptitude: Includes the verbal and quantitative composites. Verbal Composite: Verbal Analogies, Word Knowledge, Reading Comprehension. Quantitative Composite: Arithmetic Reasoning, Math Knowledge. The total time required to take the test is almost five hours, with two breaks allowed. All questions are multiple-choice with four or five possible answers. You are scored on the number of correct answers and not penalized for incorrect answers. The test does not have a pass or fail scores. The better you score, the better your chances are of being considered for officer candidacy. Each commission source determines what scores are needed to be selected or considered for their programs. To pass, applicants taking the AFOQT must score a minimum of 15 in Verbal and 10 in Quantitative. For aspiring pilot applicants, you must score a minimum of 25 in pilot, 10 in navigator, and possess a combined pilot-navigator score of 50.